The new Network DVD release of the 1978 television presentation of the Royal Shakespeare Company’s The Comedy of Errors, which premiered in 1976, reveals both stage and television versions as curious – and in many ways unsatisfying – hybrids. Given that over this past weekend I have been in Stratford filming a hybrid version of the RSC’s Julius Caesar, it feels particularly timely to review the disc. Just as the production team of The Comedy of Errors did, we were filming in the RSC’s main theatre (which has been extensively remodelled since 1978), although – as also with Comedy – most of our production has been shot away from the theatre. But the thirty-four years that separate the shoots have seen fundamental changes in production technologies, and our approach to Julius Caesar is significantly different. Moreover, and this is another advantage that our Caesar enjoys over this Comedy, our stage original is not blighted by some truly dreadful modern musical songs. Critics and audiences adored Trevor Nunn’s production when it opened in Stratford and then transferred to London’s Aldwych Theatre. In 1977 it won the Olivier Award for the Best New Musical. Which, frankly, astonishes me, given that the musical elements are a bunch of songs some way after Shakespeare’s words and somewhere a long way below, let’s say, the Lionel Bart of Oliver! The effect is particularly egregious in the closing moments, when the very beautiful reconciliation of the final couplet, which is also not without its uneasiness, is replaced by a happy-clappy song for the curtain call. Ugh. Guy Woolfenden, who was head of music at the RSC between 1963 and 1998, knocked up the tunes, but the real villain is lyricist (and director) Trevor Nunn. Perhaps it is best to say that we are glad, especially since The Life and Adventures of Nicholas Nickleby (1980) was just around the corner, that he did not give up his day job. The Comedy of Errors, however, can be played as more than a farce, with a foregrounded interest in the text’s Christian and pagan concerns, and in its underlying Ovidian ideas about transformation and the instability of identity. Not here, however, and especially not when the exorcism of Act IV Scene 4 is transformed into an endless song- and-dance number (choreography courtesy of Gillian Lynne) led by a sub-Fagin Dr Pinch (Robin Ellis). Critiquing the stage production is not, however, the primary concern of Screen Plays. Rather our interest is more with how the staging was translated to television – and in this The Comedy of Errors adopts a unique approach. The opening credits begin over exterior shots of the theatre in Stratford and continue through a montage of the audience arriving and taking their seats. As the action unfolds the screen from time to time shows the audience applauding as well as individuals – often children – watching with rapt attention. Halfway through, at the end of television’s Part Two and the stage show’s Act III Scene 1, we get an interval, along with a bell and an off-camera voice saying, ‘Ladies and gentlemen, please take your seats’. So the television version, which would have been made by ATV to meet its public service obligations as an ITV franchise holder, is playing on the cultural capital of taking the audience to the theatre – and of course not just any theatre but the Shakespeare Memorial Theatre in Stratford-upon-Avon. Except that this virtual theatre trip is an elaborate fiction, for it is apparent that the bulk of the production was shot in a television studio. Camera placing, the quality of the images (which remains exceptional, especially for a colour recording on tape from more than thirty years ago) and the construction of the visual language speaks multi-camera studio recording (with significant elements of editing) and most definitely not a multiple camera outside broadcast taping. The oddity, however, is the extent to which the production wants to project and protect the fiction. Part of this effort is the dubbed on laughter and applause track, which runs throughout – but which is occasionally exposed (as at 1:58:47) by clumsy mixing. This is deeply disconcerting, and I can think of no other television production of a stage play that has used such a ploy. 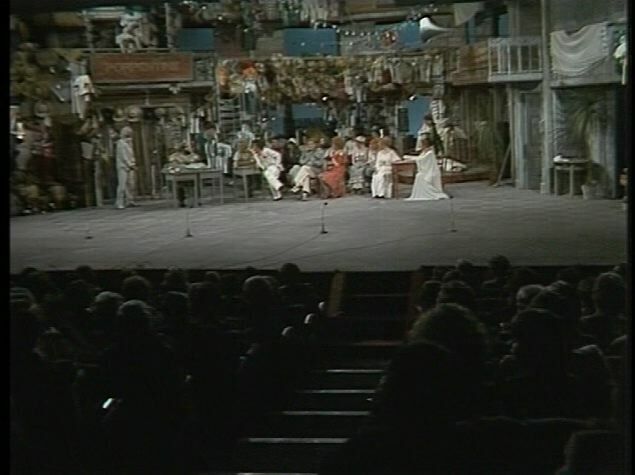 Another strategy is the use of occasional shots that show the theatre audience but which also include part of the stage (the framegrab illustrates one such). These demonstrate the visual quality that could then be achieved in a theatre and contrast markedly with the pin-sharp, brightly lit studio images. On one or two occasions the production attempts to match the action across an edit from the house to the studio, but this usually appears unconvincing (as at 2:00:01). And just once, during the climactic chase of Part Five (and Act V Scene 1), is the camera is on stage looking out at the auditorium; the characters then run between the lens and the audience. Our approach to the filming of Julius Caesar has been to combine location shot scenes (for the bulk of the play) with two scenes – the opening and the Forum speeches – which we filmed in the theatre. We have no interest in presenting either as anything other than what they are, and audiences will be able to judge when the film is shown on BBC Four later this month, whether our attempt at a hybrid approach is successful. My sense is that it will prove to be interesting, perhaps even provocative, but it may well be that a critic in 2046 is as puzzled by our experiment as I remain by the one tried out by the production team of The Comedy of Errors thirty four years ago. Further reading: at BFI ScreenOnline Michael Brooke writes about this production of The Comedy of Errors (although I believe him to be mistaken about the filming of the bulk of the play in the theatre) and, more generally, about television’s five productions of the play. The invaluable BUFVC Shakespeare database has cast and credits for the production, but lists an incorrect year of release for the television version. But never forget that Nunn went on to write the lyrics for ‘Memory’ from ‘Cats’, which must be one of the most popular and covered songs of the last 31 years – http://en.wikipedia.org/wiki/Memory_%28Cats_song%29 . If he were so minded to, he could probably retire and live on the proceeds of his songwriting career. Yes, of course, Billy – what do I know? Although in the case of ‘Memory’ he did have quite a bit of help from T. S. Eliot and his poem ‘Rhapsody on a Windy Night’. Do you know (and I don’t) if other countries make films of theatre productions, and how they do it? I would imagine somewhere like Germany, for example, with a history of being more playful or experimental with stage productions, might have tried some interesting blends of film and theatre. Frustratingly, there is very little documentation of films and television recordings of theatre productions in other countries (not that there is much here – hence our project). I know that there has certainly been a rich tradition in France, Germany and Japan, as well as a great deal of work in the United States, especially with PBS. But I am not aware of any particular experiments that suggest approaches that have not been tried here. There is the potential here for much interesting future research. This “review” strikes me as born of the typically elitist, literal interpretation of Shakespeare which frequently results in the sort of dead-on-arrival productions that put so many people off this greatest of playwrights. Shakespeare, when done right, is out-and-out marvelous, and tremendously adaptable; Trevor Nunn understood this, as does Branagh. Those who believe that modernizing a play or (heaven forbid) turning it into a musical debases the Bard are entirely missing the point. As the Times reviewer, Bernard Levin, said at the time, Shakespeare would have loved this production and gone home smiling. I had the great good fortune to see Nunn’s Comedy of Errors three times at the Aldwych during that London RSC season, and I have never spent happier moments in a theatre. The popularity of the production is testament to its success, as was the fact that the cast – despite having already performed this many times, including in a previous season at Stratford – could sometimes barely contain their own laughter as they delivered their lines. This was living, breathing theatre, not the stuffy, profound interpretations that explain why so many people think Shakespeare is boring or above them. I for one am very grateful that Nunn had the production filmed so that the sheer joy it brought to me and so many others has been preserved. I agree, a rather sniffy review for a very engaging production. But perhaps you had to see it in the theatre to appreciate the film version. Like you, I was lucky enough to see this production several times (in Stratford) – and I still have the T-shirt! A completely exhilarating experience, and every time I went the whole audience came out buzzing. When it was first shown on tv, I recorded the soundtrack on audio tape, because we didn’t have a video. And I bought the commercial video when it became available and have watched it several times since. A splendid reminder of a marvellous evening in the theatre. And the same basic wooden set was also used for an Indian Raj ‘Much Ado’ (Dench, Sinden) and a traditional ‘Romeo & Juliet (Annis, McKellen). A fantastic season. Also around that time, Nunn’s wonderful As You Like It, and John Barton’s magical production of Midsummer Night’s Dream (with Patrick Stewart as Oberon). Plus an extraordinary small-theater Macbeth with McKellen and Dench at the Young Vic (also directed by Trevor Nunn). Amazing, unforgettable stuff… I’m so grateful I was there to see it all.